Remember when, not that long ago, white and red signs advertising for Pacific Standard Time: LA/LA dotted Los Angeles streets? Well, according to a new report released today by the Los Angeles Economic Development Corporation, almost 2.8 million visitors ended up visiting the art of PST: LA/LA in the five-month period between September 2017 to January 2018. The new report also shows that the initiative’s impact went well beyond the arts and entertainment industries, and that it engaged new audiences with art. Pacific Standard Time: LA/LA was the second round of Pacific Standard Time, this time focusing on “Latin American and Latino art in dialogue with Los Angeles.” It was put on with the help of $16.3 million in grants from the Getty, and featured work in over 70 museums and institutions across Southern California. According to the report, PST: LA/LA added $430.8 million in economic output to the Southern California economy – meaning everything from hotels for out-of-town guests to materials to build the exhibits. The report also showed that the arts initiative resulted in an estimated 4,030 local jobs in industries such as arts, entertainment, and recreation, accommodations and food services, construction and education services, among others. “I think the important lesson to be learned from this is that investments made in supporting art and culture … prove that it’s not just giving a donation to the arts, it’s really making an investment that has a return,” Hartwig said. The findings weren’t just fiscal, though. Hartwig said that he and his colleagues “were also delighted by the way that so many millennials participated by visiting exhibitions and programs and presentations,” adding that about 40 percent of visitors to the Pacific Standard Time: LA/LA exhibitions and programming were under 34 years old. Pacific Standard Time: LA/LA is taking over museums and galleries across Southern California, but visiting those venues isn’t the only opportunity for students to interact with its content. Pacific Standard Time: LA/LA and the LA Promise Fund kicked off its opportunities for students to engage in art – like its student art contest – by bringing arts activities to over 300 students in the central courtyard at Manual Arts High School in South Los Angeles Wednesday morning. That was good news for Manual Arts High School senior Kimberly Gonzalez. She loves to draw, and would like to visit the visual art collections curated for PST: LA/LA. But, she might not be able to access them. Many of Learsi Martinez’ students in her English and art classes have experienced trauma in their lives and have lost someone close to them. “Sometimes, the young people don’t have spaces to talk about the person who has passed,” Martinez explained. So she uses art to create an environment where they can, and the annual Day of the Dead celebration creates an opportunity for that conversation. Martinez has her students make their own with celebratory altars displays with cardboard, paint and photos. They fill the shoebox altars with items that their loved ones enjoyed in their lifetimes. This is not the only project Martinez plans to highlight and use art in her classroom. She’s one of 50 teachers who received a grant from the LA Promise Fund and Pacific Standard Time: LA/LA to bring Latin American and Latino arts education to her students. She will use the funds to present her students’ work later this year. More than 200 students filled a city block in downtown Los Angeles Saturday morning to learn art from one of Panama’s most prominent artists. You can’t blame them if they were a bit star-struck. Olga Sinclair, an abstract expressionist and Panama’s cultural ambassador, took to a stage on Kohler Street to lead what sponsor was billed as L.A.’s largest-ever youth painting class. The event fell short of the expected 1,000 school-age children, but several of those who attended said they were inspired by Sinclair. Teaching courses on this scale was not new for Sinclair, who holds a world record for the largest communal painting created in 2014 with more than 5,000 children in Panama. Teachers and students around Los Angeles are using the citywide art collaboration, Pacific Standard Time: LA/LA, in lessons and projects. 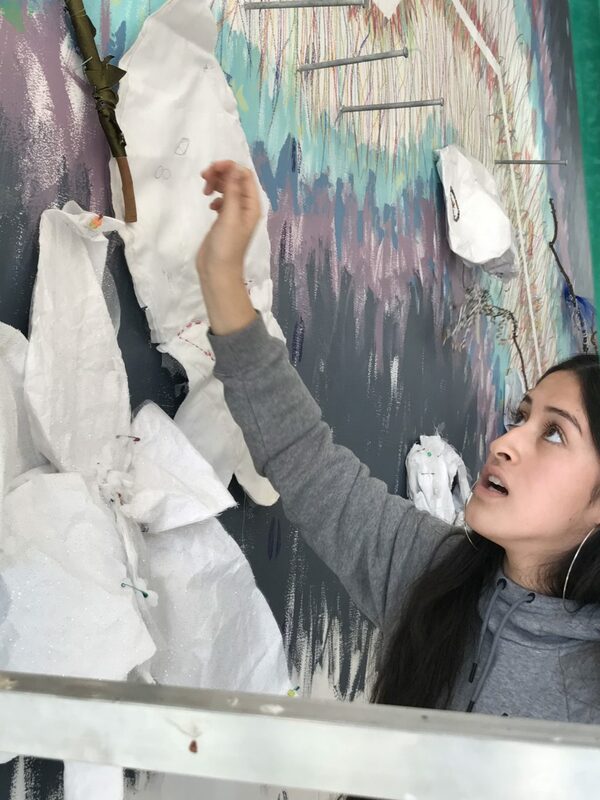 But the students from Clinton Middle School are taking it a step further: They’re not just studying the art in the exhibits open to the public around southern California – they’re making it, too. The students made white flowers and decorated them with beads, wires, and thread, with help from the PBS series Craft in America’s educational outreach program. Then, they presented these flowers to artist Consuelo Jimenez Underwood.